Add all the class and luxury of leather to your vehicle without the price or the upkeep. Our seat covers are made of the highest quality faux leather and treated with a protective coating to make them as durable as they are beautiful. 3mm of foam padding disperses heat, eliminating the struggle of red hot leather and keeping you cool on even the hottest summer days. ? Sustains your automobile interior upholstery. ? Concealed Velcro opening and adjustable straps helps installation, removal and reattachment ? Compatible with removable headrests only. ? Durable stretchy fabric with opening pocket for storage. ? Engineered to accommodate traditional and heated seats. ? Semi-customized to fit most vehicles. ? Material is water resistant. 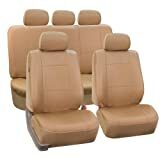 Wipe clean This full set comes with seat and headrest covers for two (2) bucket seats and one (1) rear bench and (5) headrest covers.